After spending six minutes behind the wheel of Volkswagen’s new Golf R, we can confirm that it is indeed a very special car. And it damn well better be. After all, we’ve been waiting almost three years for this thing. In one sense, the R is a more powerful four-wheel-drive version of the 10Best-winning GTI. But in another, it’s a more practical Audi TTS. Both previous generations of the R32 were powered by VW’s narrow-angle six-cylinder and put power to all four wheels. This newest R gets a turbocharged and direct-injected inline-four as in the TTS, making 256 horsepower (six more than the last R32 and nine short of the TTS) and 243 pound-feet of torque that goes to all four shoes. 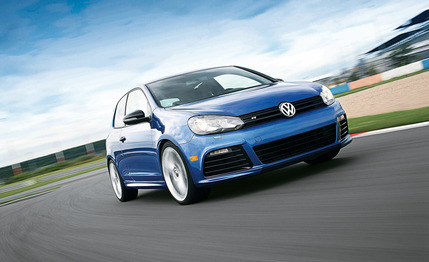 VW was listening and reacted to criticism of the DSG-only 2008 R32. Returning to the R line after a generational absence is a manual transmission, and there is no automatic option. The R is focused and built around the driving experience. Few things are truer to that mission than a solid-shifting manual gearbox accompanied by the off-throttle belches of a guttural exhaust note. New to the R, at least in the U.S., is the option of a five-door. Apparently R buyers want practicality with their performance.